Begin hike (11:45 am) at 1830m/6000ft. Begin hike (8:30 am) at 3100m/10,200 ft. Begin hike (8:30 am) at 3840m/12,600 ft. Begin hike (8:30 am) at 3860m/12,700 ft. Begin hike (8:30 am) at 4200m/13,800 ft. Begin hike (11:30 pm) at 4600m/15,100 ft. Summit (7:15 am) at 5895 m/19,300 ft.
End hike (11 am) at 1830m/6000 ft.
Aside from a regular weekly regimen of running several miles a week, preparation for the climb included a few strenuous hiking trips in California and Montana - notably the attempt to climb Mount Shasta in June, three wonderful days in late July in Glacier National Park covering 40 miles, Mount Tallac in the Lake Tahoe Area in mid-August and finally an adventure on Mount Dana on the eastern edge of Yosemite National Park in late August. This was backed up by sustained treadmill use and weekly 6-mile runs at nearby Sawyer Camp Trail backed up by regular trips to our local REI outlet to stock up on gear. For a complete packing list, click here. We also completed all our packing right at home before we left. All the mountain gear was carefully distributed among the backpacks and daypacks. All the items that would not be required till Day 2 of the mountain went into the large backpack that would be handed over to the porters. The safari gear stayed in the duffel bag. We would have very little rearranging to do at Arusha. We would leave the duffel bag with the safari clothing and the laptop with the hotel while we were out on the mountain. On our return from Kilimanjaro, we'd leave the backpacks and mountain gear with the hotel and take the duffel bag and laptop with us on the safari. We had to miss the US Open Men's final (between Roger Federer and Andre Agassi) on Sept. 11th to catch our flight out of SFO. The date of departure had been carefully chosen in April based on doing the final summit climb under a full moon. Our itinerary was decided based on working backwards from the full moon date (Sept. 18) and then making the adjustment of 1 day to get the best air fare. The non stop KLM flight from SFO to Amsterdam does not arrive in time to make the quick connection to the onward flight from Amsterdam to Kilimanjaro; thereby requiring us to connect at Minneapolis via Northwest. Fortunately our return flight back from Amsterdam was a non-stop KLM flight with the extra features and comfort of the B777. We were in good time to view the US Open final in Minneapolis but the powers that be switched from CBS to FOX for the football game just as the tennis was about to get started. We had a little over an hour to connect to the Kilimanjaro flight at Amsterdam. The DC10 aircraft at Minneapolis was the hottest we had ever had the misfortune of getting into. Everyone was fanning themselves with whatever object they could get hold of and the crew and captain kept repeatedly apologizing and reassuring everyone that the air conditioning would cool things down soon after take off. The departure was delayed for the odd reason of another aircraft blocking the tail end. You don't have to be a habitually nervous person to be bothered by this. The short connection at Amsterdam would be jeopardized by a delay. Even if we could sprint across to the other flight there is always the chance that our all important backpacks would not arrive in time. Eventually the gates turned out to be adjacent and we had close to an hour to make the connection. Tanzania is bordered by Kenya, Uganda, Rwanda, Burundi, DR Congo, Zambia, Malawi and Mozambique. Kilimanjaro National Park is wholly in Tanzania straddling the northern border with Kenya. The towns of Arusha and Moshi are the tourist centres for the various tour companies (outfitters) who operate the Kilimanjaro and Safari tours. The international airport is located between Arusha and Moshi. Mount Meru is in Arusha National Park and is relatively closer to Arusha town. The safari circuit lies to the west of this area. Kilimanjaro airport looked better than we expected. Comparable in size to the airport at Madras, it had no aerobridge facility thereby requiring passengers to deplane in the traditional manner. This was not a bad thing as it allowed those of us in the rear of the aircraft exit quickly (the male flight attendant quipped "there is Kilimanjaro here too" as we were intently watching the crowd in front us). We cleared immigration quickly and spotted the truncated name ("Malin") on the placard held by Joseph from Good Earth tours. We waited another 20 minutes for two additional people coming on the same flight who were Good Earth clients as well. Scott (coming from Columbus, OH) came first and was joining his online pal Ketan from Washington DC who had arrived earlier and Amy (coming from Phoenix, AZ) joined us later. They were also headed for Kilimanjaro but by different routes (Scott by the Lemosho route starting the very next morning and Amy by the Rongai route starting the day after next - ours was the Machame (aka Whiskey) Route starting the day after next). We were all upbeat and excited about the next week and where it was going to take us as we exchanged notes about our plans on the 40 minute ride from the airport to Arusha on a straight stretch of highway. It was dark and we had no hope of catching a glimpse of Kilimanjaro or the nearby Mount Meru (4566m/15,200 ft.). That had to wait. Le Jacaranda hotel in Arusha is classified as "mid class" by Good Earth (as compared to the nearby Impala hotel which is better appointed) and has a rustic setting with plenty of trees sheltering the restaurant and lounge. Moses was in charge and arranged for our luggage to be transported to our rooms through the hands of a staff member in full Masai costume. We were 10 hours ahead of our home clock and as expected, we went to sleep right away but woke up in the early hours of the morning and stayed awake till dawn and breakfast. We were briefed by the tour operators Ndashy and Mange (self proclaimed "movers and shakers" - meaning that they only do the organizing and that their "guiding" days are over) who found that we already knew whatever they had to tell us. Ndashy quipped "please don't outpace our guides on the mountain" but seemed reassured that we were well prepared. After advising us to eat a heavy breakfast the next day and accepting our traveler's cheques for the full payment for the Kilimanjaro and Safari trips, they departed. We thought of a day trip to Arusha National Park or even hiking the lower trails of Mount Meru for the day, but decided to relax in the hotel after a relaxed walk through Arusha town and lunch at the Indian restaurant at the Impala. We bought topographic maps of Kilimanjaro and maps of Tanzania and the national parks in Arusha and converted some US Dollars to Tanzanian shillings (@ 1050 to the US dollar). Kilimanjaro is the highest and youngest of the three big volcanoes of East Africa (Mt. Kenya 5199m and Elgon 4321m being the other two). It has 3 peaks, Mawenzi (5149m) on the east, Kibo at center (with Uhuru peak at 5895m the highest of the three and the highest point in all Africa) and Shira (4006 m) on the west. Its oldest lavas may be only some 1 million years old and small scale activity on the peak of Kibo has probably taken place within the last 200 years. The dimensions of the base are about 80 x 48 km. There is an outer caldera on Kibo some 2.5 km in diameter. 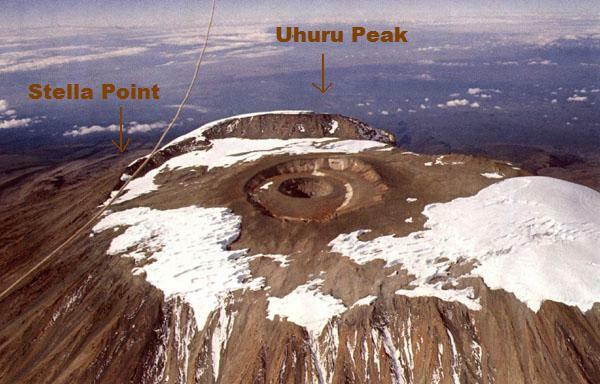 The highest point, Uhuru Peak, is on the southern rim of this caldera. Within the caldera is an inner cone some 820m across, which in turn contains another cone and crater (called the Reusch crater) some 340m in diameter. At present, Kilimanjaro is best described as dormant, rather than extinct, though the likelihood of future large scale eruptions are rather low. However, there are active steam jets (fumaroles) within the inner crater. Marangu Route The so called "tourist" or "Coca-Cola" route. Ascends all the way without any descents and is the shortest way to the top. The only route with huts for sleeping quarters. Good chance of spotting colobus monkeys. Can be crowded and chances of altitude sickness are high due to the short ascent - which can be reduced by staying extra days on the mountain. Starts from the Mandara Hut (South East corner) and then through Horombo and Kibo huts to Uhuru. Descent is a return on the same route. Machame Route The so called "Whiskey" route is a round about way of getting to the peak; first heading in the direction of Shira plateau, away from the central Kibo peak and then joins with the Shira/Lemosho route coming in from the west before joining the Umbwe route through the Great Barranco valley and then continuing on the Southern Circuit to the junction with the Mweka route and finally bending back northwest to the outer crater rim on the Mweka route. Descent is via the Mweka route. Fast becoming an alternative "tourist" route with increasing crowds. Camping is the only option. Rongai Route The only route coming from the northern side offering a view of Kenya's Masai plains. Because of its northern starting point, the drive to the starting point is very long. Descent is via the Marangu route. Umbwe Route Considered the most scenic. Extremely steep and strenuous. The Machame route joins this route on Day 3 at the beautiful Great Barranco Valley. Lemosho/Shira Routes 2 separate routes coming from the west starting at a high elevation. The 4WD track takes you quite high up the mountain. Extra nights stay required at Shira camp to acclimatize. Due to the deep reach of the 4WD track, this is one of the designated emergency evacuation routes. Western Breach Route The most dangerous of all the hiking routes, twisting and turning at the higher elevations. Not recommended for descent due to risk of rock fall. We chose the Machame route for our climb and decided to split Day 4 into two thereby making a total of 7 days (6 nights) on the mountain. The overriding criterion used in our decision was that this route affords one the chance of acclimatization due to the concept of climbing high and sleeping low. This is best illustrated by looking at the elevation profile of Day 3 (starting at 3800m, going up to 4600m and then descending to 3900m). While it may seem wasteful to lose hard earned altitude gains, the acclimatization advantage is too crucial to disregard. The above graphic illustrates the Machame route elevation profile. Our own path was identical to the above for Days 1, 2 and 3. While the third member of our group (Gil) chose the Alternative Route (Western Breach) illustrated above, we chose to continue on the regular route. We also split Day 4 into two (stopping at Karanga Camp for the night). Thus, Day 5 above, became Day 6 for us. The descent is illustrated by the narrow right-to-left strip at the bottom. The entire Machame route can be seen in this graphic from the New Kilimanjaro Map. Starting at the Machame Gate from below left, due north to Machame Camp, continuing on to Shira Camp, turning sharply right and merging with the Lemosho route coming from the West, then onto Lava Tower Hut (with option to avoid Lava Tower and take the direct porter route to Barranco Camp) and the turning back south towards Barranco Camp to merge with the Umbwe route. The Alternative Western Breach can be seen on the coiled switchbacks proceeding directly towards Uhuru Peak. The conventional Machame Route proceeds east from Barranco Camp and after passing Karanga Camp it merges with the Mweka route and turns left proceeding north to Barafu camp and then veering northwest towards Uhuru peak on the coiled switchbacks that eventually flattens out at Stella point, where it joins the Marangu route coming from Gilman's point from the right. That's it. As simple as that. Just don't expect any turn signals that's all. Just follow your guide and don't get lost. This may be the New Kilimanjaro map, but they've still allowed their memories to dictate the amount of white on the top. But it is a nice graphic with the widely varying vegetation represented by the following legend. "First. Don't underestimate the mountain. Kilimanjaro is BIG and the whole exercise is HARD WORK! You will probably be cold at sometime. Worse, you may get soaking wet cold in the rain or sleet. At the higher altitudes you will almost certainly suffer a headache and may feel sick/vomit. But this is normal on a mountain of just under 20,000 ft. Console yourself with the thought that most of the others with you feel the same way and that it can't go on forever. Below is a brief synopsis of how an average walker might expect to feel while ascending the mountain. Park gate to 3000m. The first hour or so's walk is a novel experience. The scenery is interesting and if you left early, it is still quite cool. Pulse rate is between 100-120 bpm and the breathing rate at about one cycle for every 3-4 steps. By 11.00 am it has started to warm up, so you are sweating a bit. The legs start to feel the strain of non stop uphill walking and the calf muscles ache. A sit-down breather every 30-40 minutes is welcome. Once reaching the first hut, a cup of tea/coffee revives you rapidly, and within an hour you feel almost normal. 3000m - 4000m. You should have slept very well and breakfast tasted great. You're somewhat stiff all over, but this soon wears off after you get walking. Again the first hour or so up the moorland is very pleasant, though after that the walk becomes a bit of a drag as the scenery becomes more monotonous and unvarying. A couple of blisters are forming, one on the instep and another on the small toe, but what the hell! Pulse rate is similar to yesterday, but the pace of walking is definitely slower. Once at the hut, if you have not used sunglasses during the walk, a mild headache may occur. Appetite still OK for tasty food but not too fatty. Leg cramps in the evening. 4000m - 4800 m. You did not sleep as well as you might have expected. The headache got worse during the night but goes soon after breakfast. Fruit, bread and jam were fine, but the sausage and bacon were a definite no no! The blister that you should have attended to yesterday is now taped up and feels a lot better. Again the first hour or so of walking is great, thereafter it's one step after the next. Around noon, the Kibo Hut comes into sight, briefly seen through the mists. However, when seen again, it never seems to have got any closer. Soon it starts to sleet and hail, and the feeling of "Why am I doing this?" now gets asked aloud. Pulse is steady between 130-150 and you're taking a breath in as you put one foot down and breathing out on the next step and so it goes on and on and on...At the Kibo Hut a drink goes down OK, but the mere thought of food is Ugh! Your head throbs just behind the eyes, you're cold, wet and miserable so to collapse into the sleeping bag, even though it's only 3 pm seems a great idea. 4800m - Summit. Getting up at midnight isn't so bad, after all you've not slept since some noisy sod woke you up by slamming the hut door at 8 that night. You've now put on all the clothes you have but are still half frozen with the cold. The tea and biscuits you forced down lower tasted foul, and after a half hour's walking you bring them back up. Immediately you feel 100% better. Like the previous day, its again one foot after the next if its frozen scree, or 2 up, slide back 1, if it is not frozen. Just before dawn you reach Gillman's point and your guide tells you that you've reached "the top" (not quite true), and you thank him for his assistance in pushing you up the last 200m. Now you have a choice. Either you lie down and contemplate the walk back down though preferably you wish you could just die, or there's Uhuru Peak another hour and a half onwards. Decisions. Decisions. Should be illegal at this altitude. Descending. The walk back to Gillman's from Uhuru was pure hell, particularly the short sections of uphill, however once you leave the crater rim, you can noticeably feel the air getting thicker and heavier in the lungs with each meter of descent. Now that its daylight you can see the full horror of the scree slope, and you wonder how anybody, let alone yourself, ever made it up. You start to feel better, good even, particularly so as you pass several groups still struggling upwards. That night at Horombo you start to sleep the sleep of the grateful dead, though next morning its a struggle to get out of your bag as every muscle hurts. From here the walk down is...well enough here. Find the rest for yourself." The above passage is worth quoting at length because we read it before climbing as we studied the map and guide. Other reports we'd read provided other viewpoints some more optimistic and others even worse. So we did not know quite what to expect. But we'd had enough of waiting for months and wanted to get on with it to see what happens. Is Diamox the answer to altitude sickness? Should you take it? Or not? You are likely to hear heated arguments both for and against. We tried Diamox at the Inca Trail in Peru and felt no altitude sickness. We tried it again at Mount Whitney with similar results. We came across more evidence on Day 3 of this trek, which we'll talk about later.